Srinakharinwirot University was developed from two institutions: The Advanced Teacher Training School, founded in 1949 and the College of Education, founded in 1953. In 1974, it was named Srinakharinwirot University. In 1973, Professor Dr. Sudjai Laosuntorn was the President of the College of Education. Prior to October 14, 1973, the university staff, students and civil servants lobbied the Thai government to raise the status of the College of Education to university level and transferred it from the administration of the Ministry of Education to that of the Bureau of University Affairs. Despite the constraints of the then military government, the college made its structure, administration, and limited learning and teaching more flexible and became a university with diverse professions. On June 29, 1974, Srinakharinwirot University, ‘the university of progress and urbanity was named with Professor Dr. Sudjai Lao-suntorn as President from 1969 to 1978. The university followed a multiple-campus administration system for 16 years. After 1990, each campus became an independent university which had its own budget and administration. In 1990, Bangsaen and Pisanulok campuses were upgraded to Burapha University and Naresuan University respectively. In 1993, Patumwan, Bangkhen, Prasarnmit campuses were amalgamated as a central campus. In 1994, Mahasarakam campus was upgraded to Mahasarakam University. 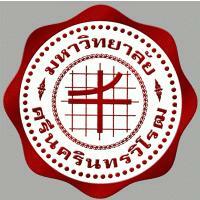 In 1996, Songkhla was upgraded to Taksin university. In 1996, Srinakharinwirot University was expanded to Ongkaruk, Nakhon Nayok province. In the past, Srinakharinwirot University consisted of six faculties: the Faculty of Education, the Faculty of Humanities and Science, the Faculty of Social Science, the Faculty of Science, the Faculty of Physical Education, and the Graduate School. Later, in phase 5 of the Higher education development plan (1982-1986), the Faculty of Medicine was set up; in phase 7 (1992-1996), the Faculty of Engineering, the Faculty of Fine Arts, the Faculty of Dentistry, and the Faculty of Pharmacy; and in Phase 8 (1997-2001), the Faculty of Health Science and Nursing.